So it was the school fete yesterday – the hottest day of the year so far and not, you may well feel, ideal conditions to sell shed-loads of buttercream icing. 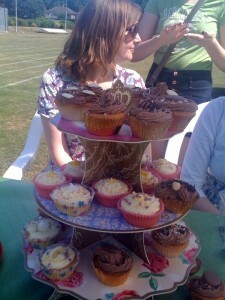 Nevertheless, my girls and I had made a commitment to run a cupcake stall and run it we were going to, no matter what. Saturday, the day before the fete, was also hotter than hell. You probably felt a little warm as you went about your business. Well, the kitchen of Divorce Towers was 400 degrees hotter than Satan’s armpit, as we whisked and baked and iced all day long. Luckily, the cupcakes produced in these far less than perfect circumstances were actually rather beautiful. We don’t have anything clever like cool bags but we do have a few ice packs, which I tucked around the cakes to stop them vanishing into lakes of goo. 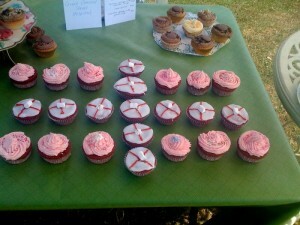 We even created an optimistic range of St George cupcakes, which went like, well, hot cakes. Unlike our team. Grrrrr. The fete was fun – my lovely friend S brought her beautiful cakestand along, which was just as well as I’d had a meltdown before leaving and left my stands and a batch of beautiful pink dollymixture cakes behind. Other friends came by and chatted and helped and we all had a wander around the other stalls and found a few bargains. We sold the cakes in aid of Great Ormond Street Hospital and a friend did say she thought it was very good for the girls – it was their idea, they did the lion’s share of the baking themselves, they loved the selling part and I think they feel a little glow of achievement. I did pilfer some of the money in order to buy the delicious PSA hamburgers at lunchtime and a friend hissed, ‘that’s a defibrilator you’re spending!’ But don’t worry, I put the money back. She was quite right, of course. We all would have been better off not watching. If only that bottleneck had gone on. And on. And on. And we could have missed the whole game. Oh well. The England car magnet has now come off the back of the Divorcemobile. And only the fact that David Cameron had to watch the match sitting with the German PM has cheered me up. I don’t envy you cooking in all that heat. And as for the England match, don’t get me started. I know!! Grrrr doesn’t even begin to cover it. Well, never mind, there’s always poor old Andy Murray …. Right, I think we should start a team – your 15-month-old, me, you, my cat and a few old saucepans. I reckon we’d get further. We saw Wayne Rooney’s new house in Barbados when we were stuck there – I think he just wanted to get back there as quickly as possible. Bah. You must be crazy cooking in that heat but they do look rather delicious!!! Looks like your cupcakes were winners all round – unlike England! Why or why do we expect them to be in the final every time? It’s ridiculous, isn’t it, yet hope does spring eternal. Until it gets thoroughly trashed, that is ….